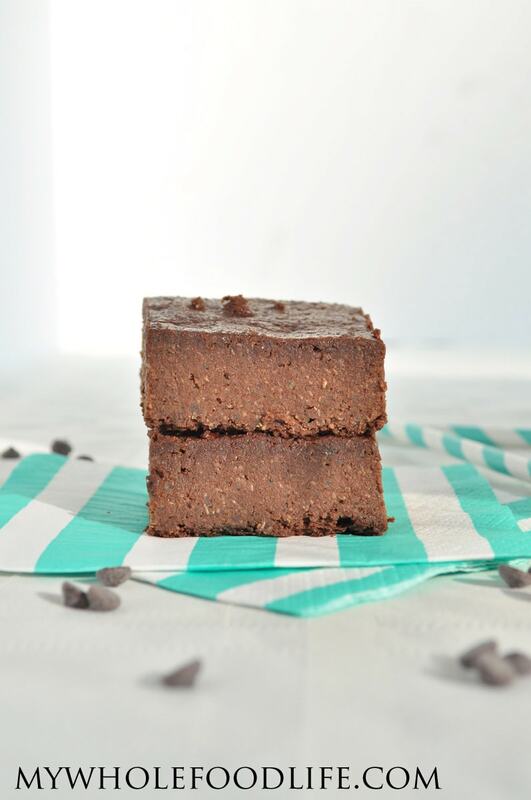 Quinoa Brownies that are vegan and gluten free!! Yes I did it. I made quinoa chocolate brownies. After I made the quinoa cookies and they were a hit, I thought I would experiment with quinoa brownies. I promise you these brownies will not disappoint! They are really yummy and even easier to make! If you like healthy brownie recipes, you may also like this and this. These delicious brownies are vegan, gluten free and grain free. Quinoa is technically a seed and not a grain. You would never be able to tell there was quinoa in these brownies. These healthier brownies also come with a punch of protein. Did you know that quinoa is one of the few plant based, complete proteins? I hope you enjoy these brownies as much as I did. A healthy brownie with hidden superfoods! Put all ingredients in a blender . Pour mixture into a parchment lined baking dish. I used an 8x8 dish . Please wait until the brownies have completely cooled before removing them from the pan and cutting into squares. Please store these brownies in the fridge in an air tight container. They should last 7-10 days. They can also be frozen for longer storage. Enjoy! Rich and delicious! Thank you! Back in November I made these up until before baking. I poured the batter into a freezer container and let it freeze until just the other day. I took it out of the freezer and let it thaw overnight in the fridge and then baked as regular the next day. They turned out great! You wouldn't be able to tell a difference. Substitute for oil?.. for those who don't want to use oil? Melissa, these were AMAZING!!! I'll be honest, I've tried black bean brownies before and hated them. But THESE... these are magnificent! I was a little leery using quinoa in a dessert-y form but no longer. I am HOOKED! I put a little bit of peanut butter on the top of my brownies and they were absolutely divine. My blender labored HARD during the mixing process ($20 Walmart blender, go figure) but it got the job done. I will be making these time and time again! After eyeing these for a while, I finally made them, and I am SO glad I did. They really are absolutely delicious. It is good to know they would last in the fridge or freezer, but that info wasn't necessary; they whole dish was devoured the same day I made them. :) My husband and daughter loved them. This is the second recipe I have tried of yours, and the second one we have all loved. I'm becoming a fan for sure. Thank you! OH! The only "trouble" I had with this was that my Osterizer blender didn't want to blend the batter, and I didn't want to fight it. So, just stirred it up, poured it into the parchment-lined pan & baked it. They were wonderful. If anyone asked me, I would honestly tell them to just skip that step. Thanks again! Thanks Jennifer! So glad you liked them! I hope your blender is okay. Is there a substitute for almond butter that I can use? I have a niece/nephew who have dairy/gluten/nut/egg allergies and so I can't use peanut butter/almond butter. I don't know if they'd taste good with sunbutter...any suggestions? Thanks! I'm allergic to coconut, so I wondered if I could use another oil, instead? I saw above that you mentioned using additional applesauce. Would that make them too mushy and "raw" in the center? I'd prefer applesauce to oil, as I plan to use real eggs. Thanks! I think using applesauce for oil should be fine. Ummm...I love 'em. I will definitely make these again. Mine got stuck in the blender, so I had to scrape them out and finish the batter in a food processor. However, they were worth the wait. Delicious!!! Ummm...I love 'em. I will definitely be making more of these. The batter got stuck in the blender, so I had to scrape it out and finish in a food processor. However, they were worth the wait! Delicious!!! Yay!! Glad you liked them Karen! I made these the other day and they tuned out great. There was a thread about quinoa on Devin Alexander's Facebook page so I shared the recipe and she came back and said "Do you realise these are super high in fat and sugar therefore high in calories?" I feel like a naughty child! Can you give me a good answer to hit back with? Thanks Melissa! I do agree. Since I have been making my own healthy treats from scratch with the help of your great recipes and working out regularly my clothes still fit me and I am not depriving myself. In fact if I do eat a shop bought cookie or cake they taste quite inferior now! Looks soon delicious! I'm def making them. Can I eliminate the maple syrup? Thank you! I am not sure you can eliminate it without replacing it. LOVE LOVEL LOVE THIS RECIPE ~ so excited I have an awesome, yummy recipe my whole family (even the 7 and 10 year old) can make and enjoy without the awful guilt. High in protein and gives us energy instead of needing a nap after we eat them! Thanks Cori! Glad it's a hit!